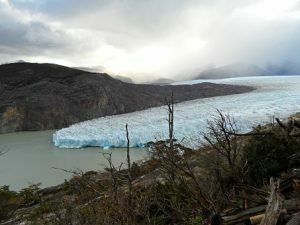 A glacier is a persistent body of dense ice that is constantly moving under its own weight; it forms where the accumulation of snow exceeds its ablation (melting and sublimation) over many years, often centuries. Glaciers slowly deform and flow due to stresses induced by their weight, creating crevasses, seracs, and other distinguishing features. They also abrade rock and debris from their substrate to create landforms such as cirques and moraines. Glacial ice is the largest reservoir of fresh water on Earth. Because glacial mass is affected by long-term climatic changes, e.g., precipitation, mean temperature, and cloud cover, glacial mass changes are considered among the most sensitive indicators of climate change . (Source: Wikipedia) – All the more reason to go out of your way to visit the spectacular glaciers listed here.